Then you could profit from a straightforward look at the ideas behind designing a garden, supplemented with hands-on project guides. Ever wonder about the secrets underlying the magic art of the landscape designer? Well, the resource linked to above translates that "magic, " making it understandable for the do-it-yourselfer. 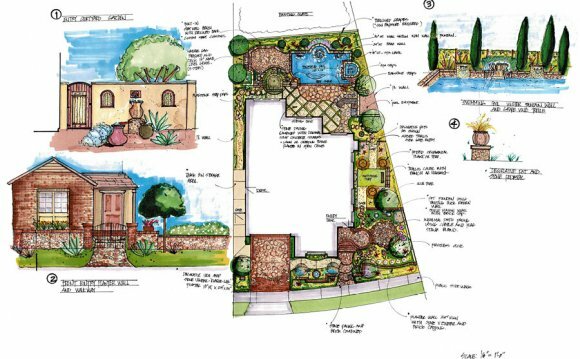 Study these photos illustrating landscape design ideas and learn about the concepts the pros employ. Whenever you put something together yourself, you are engaged in designing, however humble the project. Sometimes we take our designing skills for granted, because what we're putting together is so commonplace for us that we are no longer conscious of the designing process. For instance, you are employing designing techniques when you compose a letter to send to somebody. Your basic "elements" to accomplish such a task include vocabulary, spelling and grammar. Somewhat more complex elements, or "principles, " build directly on the basic elements. Letter-writing principles include conveying your ideas clearly and coming across as a courteous, intelligent individual. Your success with these principles will largely determine whether or not your letter achieves its ultimate objective.